Red Hot Poker. 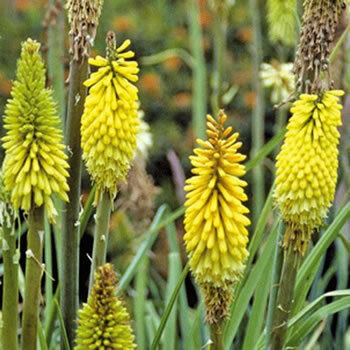 A clump-forming perennial with narrow grass-like, arching leaves and spikes of ivory to yellow-green flowers. Height 30-40cm. Spread 25cm. Flower colour Cream, Yellow, Green. Flowers from August to September. Herbaceous. Foliage colour Green. Hardy. Planting instructions Water thoroughly before planting.